Today I am sharing with you my project for this week's Joy's Life design team challenge. Our challenge this week was to use buttons. Easy for me because I LOVE buttons!! 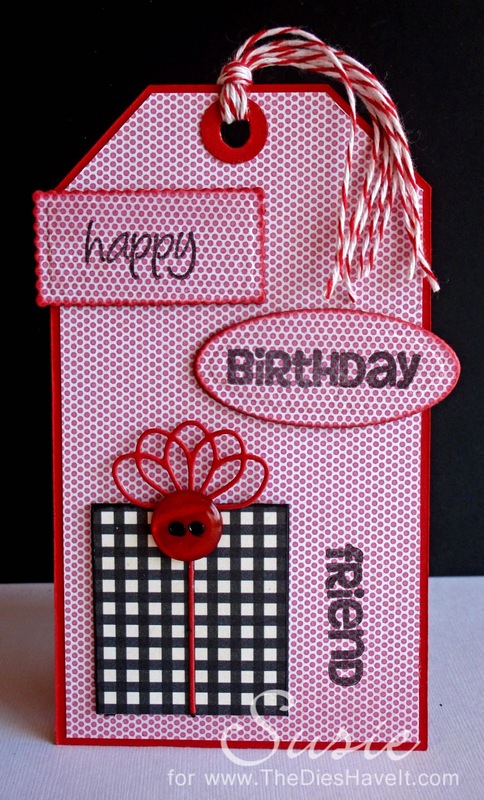 The sentiments stamps are from Everyday Occasions stamp set. I thought it would be fun to place two on die cut shapes and one right on the tag itself. The die I want to show you today is that red bow from Memory Box. You can see it and buy it here. The set has two bows in it - one as cute as the other!! And I really want you to see it in person, so I am going to give this tag away. Just leave me a comment and I'll select one post at random on 1/27. I can't wait for one of you to have this tag on hand to give with your next friend birthday gift! So leave me a comment!! 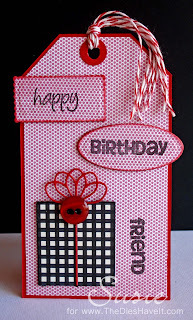 I'll be back tomorrow to show you a fun card that uses dimensional stickers and one sweet die.